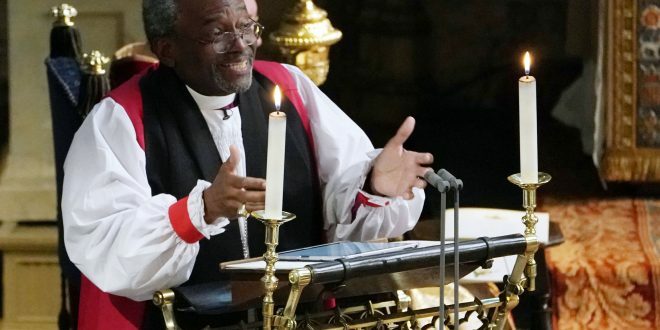 For many, his impassioned sermon — punctuated with themes of politics, social justice, civil rights and quotes from Martin Luther King Jr. and the controversial Catholic theologian Pierre Teilhard de Chardin — was a highlight of the historic matrimonial ceremony. There’s much to be said about the message delivered at St George’s Chapel, Windsor Castle, but we’ll let you read it for yourself. There’s power in love. Don’t underestimate it. Don’t even over-sentimentalize it. There’s power, power in love. If you don’t believe me, think about a time when you first fell in love. The whole world seemed to center around you and your beloved. Oh there’s power, power in love. Not just in its romantic forms, but any form, any shape of love. There’s a certain sense in which when you are loved, and you know it, when someone cares for you, and you know it, when you love and you show it – it actually feels right. There is something right about it. And there’s a reason for it. The reason has to do with the source. We were made by a power of love, and our lives were meant – and are meant – to be lived in that love. That’s why we are here. Ultimately, the source of love is God himself: the source of all of our lives. There’s an old medieval poem that says: ‘Where true love is found, God himself is there. There’s power in love to lift up and liberate when nothing else will. There’s power in love to show us the way to live. Set me as a seal on your heart… a seal on your arm, for love is as strong as death. But love is not only about a young couple. Now the power of love is demonstrated by the fact that we’re all here. Two young people fell in love, and we all showed up. But it’s not just for and about a young couple, who we rejoice with. It’s more than that. A movement grounded in the unconditional love of God for the world – and a movement mandating people to live that love, and in so doing to change not only their lives but the very life of the world itself. I’m talking about power. Real power. Power to change the world. If you don’t believe me, well, there were some old slaves in America’s Antebellum South who explained the dynamic power of love and why it has the power to transform. “They explained it this way. They sang a spiritual, even in the midst of their captivity. It’s one that says ‘There is a balm in Gilead…’ a healing balm, something that can make things right. “Oh, that’s the balm in Gilead! This way of love, it is the way of life. They got it. He died to save us all. “He didn’t die for anything he could get out of it. Jesus did not get an honorary doctorate for dying. He didn’t… he wasn’t getting anything out of it. He gave up his life, he sacrificed his life, for the good of others, for the good of the other, for the wellbeing of the world… for us. Pierre Teilhard de Chardin – and with this I will sit down, we gotta get you all married – French Jesuit Pierre Teilhard de Chardin was arguably one of the great minds, great spirits of the 20th century. Fire made it possible – there was no Bronze Age without fire, no Iron Age without fire, no Industrial Revolution without fire. Anybody get here in a car today? An automobile? Nod your heads if you did – I know there were some carriages. But those of us who came in cars, fire – the controlled, harnessed fire – made that possible. And he then went on to say that if humanity ever harnesses the energy of fire again, if humanity ever captures the energy of love – it will be the second time in history that we have discovered fire. Many young people participate in the rental economy. They own less stuff than their parents' generation, and they rent or share a lot more. For some it's a choice; for others, a necessity.